Sydney, NSW, Australia, 21 June 2018 – ŠKODA Australia launches its first medium SUV, the ŠKODA KAROQ, priced from $29,990 RRP for the manual and $32,290 for the DSG. Following in the footsteps of its Car of the Year award-winning sibling - the seven-seater KODIAQ - the KAROQ brings leading technologies, substance and style to the mid-size SUV segment. All topped off with the 'Simply Clever' touches and remarkable value-for-money that distinguish a ŠKODA from the pack. The KAROQ is ŠKODA's vehicle for most lifestyles. It is as well suited to the daily school run of the family of four, as it is to the individual taking a surfboard up the coast on weekends, or the company director paying visits to business partners in the city. The vehicle's ingenious VarioFlex system lends it an unparalleled versatility, allowing owners to fold and remove as many of the rear three seats as they wish. The KAROQ can be a five-, four-, three- or two- seater. Indeed, the KAROQ, though fractionally smaller than key rivals by exterior measurement (see table in Appendix), is more spacious in most interior aspects. With rear seats fitted and fully pushed back, the KAROQ's luggage compartment affords 479 litres. Push these seats forward and the space increases to 588 litres. Fold them flat and you have 1,605 litres. Take them out - a task easily accomplished – and there's a massive 1,810 litres to fill. The KAROQ initially comes in front-wheel drive, powered by the latest-generation 1.5-litre four cylinder turbo-petrol engine, producing 110kW and 250Nm, with the choice of a six-speed manual transmission or a seven-speed DSG. The KAROQ gets from standing to 100km/h in 8.4 (manual) or 8.6 seconds (DSG). Combined fuel consumption is 5.7l/100km (manual) or 5.8L (DSG). A more powerful all-wheel drive is due to hit Australian shores in 2019. The KAROQ's versatility is married with safety, comfort and style. 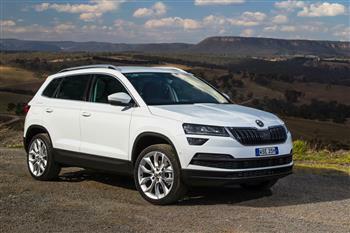 ŠKODA Australia has furbished its newest SUV with the latest driver assistance technologies. These include potentially life-saving standard functions such as Front Assist with City Emergency Brake, Multi-collision Braking (MKB), Hydraulic Brake Assist (HBA), seven airbags to cover all occupants, acoustic rear parking sensors with Manoeuvre Braking Assist, Rear View Camera, Rain Braking System (RBS), and fatigue detection. ŠKODA's attention to the finer details manifests in a host of 'Simply Clever' touches, also standard. These include Adaptive Cruise Control, Advanced Keyless Entry including Smart Start (KESSY), dual-zone Climatronic air conditioning, electric parking brake with Auto Hold, LED-illuminated make-up mirrors in the sunblinds, tablet holders for rear passengers, a ticket holder on the A-pillar, and an umbrella under the front passenger seat. The luggage compartment alone contains a three-net system, an integrated LED torch, and plastic mounts with Velcro fasteners to secure objects. Even the glove box contains a holder for pens, cards, coins and SD cards. Every inch of the vehicle has been designed with maximum comfort and utility in mind. The KAROQ also has a standard high-resolution infotainment system with an 8-inch screen and SmartLink connectivity. Owners can cruise to their favourite tunes, access maps and more with Apple Carplay® and Android Auto™. The system also comes with Bluetooth® audio and streaming, voice control, USB, AUX and an SD card slot. Select functions of the infotainment unit can also be controlled from the vehicle's 3-spoke multifunctional, flatbottomed,chrome-decorated leather steering wheel. The KAROQ's modular interiors are paired with the sleek exterior lines and assertive stance characteristic of ŠKODA's cutting-edge new design language. Design highlights include an LED door light which projects the ŠKODA logo onto ground when doors are opened, welcoming in drivers and passengers, and LED ambient lights running in decorative strips along the front and rear doors, bathing the interiors in a soft glow. The ambient lights can be set to the driver's favoured colour out of 10 available choices. The KAROQ sports a dynamic, modern appearance, built on the brand's new SUV design language. Its body, 4.38m in length, is composed of clear lines with precise contours. In the front section, a striking threedimensional, chrome-plated radiator grille is framed by split headlights and a powerfully-built bumper. This lends a sharp and strong look to the KAROQ, sustained by the tornado line running from the front wings to the rear lights. The two split headlights have a crystalline quality, inspired by the fine art glass famously produced in the Czech Republic – ŠKODA's birthplace. At the rear, the tail lights are also split in two and styled in the C-shape typical of ŠKODA. The outer sections of the tail lights are set within the side panel frames, with the inner sections embedded within the tailgate. Horizontal lines above and below the lights emphasise the width of the vehicle (1.84m), and hint at the ample space contained within the KAROQ. The vehicle's sides are characterised by short overhangs, a retracted rear and an early-falling roof line, opticallyextended by a contour in the D-pillar. The wheel arches are framed by wide, angular trims - another shared design element conferring a powerful look to ŠKODA's SUVs. The KAROQ comes with a choice of eight exterior paint finishes – three standard colours (Candy White, Steel Grey and Energy Blue), and five metallic options (Moon White, Brilliant Silver, Quartz Grey, Velvet Red, and Emerald Green) and one pearlescent (Magic Black). The interior of the KAROQ combines comfort with modern functionality. The KAROQ offers generous interior space, even without taking VarioFlex into account. Its width is 1,486mm in the front row and 1,451mm in the rear. Headroom is 1,022mm in the front and 993mm in the rear. Climatronic airconditioning with Air Care functionality is standard. It not only provides dual-zone temperature control, but also cleans the air circulating within the vehicle and filters allergens. The KAROQ also carries the distinctive design elements and elegant finishes that owners have come to expect from ŠKODA. These include a three-spoke multifunctional Chrome-decorated leather steering wheel with radio and telephone controls, and a trip computer with a high resolution colour display. Meanwhile, the interplay of ambient lighting across clean and precise contours in the cabin adds a sense of drama to the vehicle. LED light strips running horizontally on the doors, the front passenger side of the dashboard and on either side of the steering wheel can be configured to the driver's selected colour. In a thoughtful little touch, drivers are also welcomed into the KAROQ with an LED projection of the ŠKODA brand logo on the ground, when the doors to the vehicle are opened. The VarioFlex system sets the ŠKODA KAROQ apart as one of the most versatile SUVs in the mid-size segment. With VarioFlex, the KAROQ's rear three seats can be easily repositioned and even removed to suit the comfort and needs of the driver and occupants. The system endows the KAROQ with a highly variable interior space. With the rear seats fitted and fully pushed back, the KAROQ has 479 litres of luggage room. The outer rear seats can be shifted both lengthwise and crosswise – pushed fully forward, the load capacity increases to 588 litres. All three rear seats have individually adjustable backrests and can be fully folded forward, freeing up to 1,605 litres. They can also be entirely removed, with a single hand movement, to create a van-like configuration, with a massive 1,810 litres of space behind the front seats. In this way, the KAROQ adapts to a wide range of lifestyles. With its versatility and style, it is truly a vehicle for all walks of life. In addition to the variable luggage space afforded by VarioFlex seating, handy touches in the boot like bag hooks and storage nets offer further convenience and practicality to owners. The VarioFlex seats come with a flexible, retractable boot cover attached to the tailgate which, when extended, forms a 'shelf' for storing lighter items. With the optional Premium Pack, the tailgate is electrically operated and opens/closes at the touch of a button from inside or outside the vehicle. Owners can opt for a hands-free experience with Virtual Pedal, available in the Tech Pack and Launch Pack, which automatically opens/closes the boot with the swipe of a foot under the rear bumper. This function is particularly helpful when the driver's hands are full. Built on the Volkswagen Group's modular transverse matrix (MQB), the ŠKODA KAROQ has a rigid but lightweight body, with superior handling and agility on road. The SUV's dimensions hint at its robust stance and generous interiors. It sits at 4,382mm long, 1,841mm wide and 1,603mm tall, with a wheelbase of 2,638mm. The DSG variant weighs in at just 1,353 kg, without occupants or luggage, and the manual adds merely 15kg (1,368kg). In addition, the KAROQ's body is constructed to handle rougher terrains, with a 183mm ground clearance and 19.9 degree ramp angle. Front Assist including City Emergency Brake utilises a radar sensor to monitor the distance between the KAROQ and the objects in front of it, up to speeds of 210km/h. Should it detect that a collision is imminent, the system issues successive warnings to the driver and, if necessary, initiates an automated emergency stop. Adaptive Cruise Control (ACCC) uses the same radar technology to help the driver maintain a desired distance from the car in front, adjusting the speed of the car accordingly and applying the brakes to avoid potential collisions. The KAROQ is also able to prevent potential collisions while parking. Manouevre Braking Assist detects obstacles behind the KAROQ, sounds acoustic warnings, and brakes if they pose a risk of impact. In the case of an accident, the Multi-collision Braking activates to prevent further uncontrolled movement of the vehicle by braking, thus reducing the possibility of a further collision. At the same time, the hazard warning lights flash and the brake lights remain switched on. The KAROQ also memorises its driver's steering characteristics, and detects deviations from their normal behavior. Drivers are issued an alert from the instrument cluster, should the system detect signs of fatigue. Meanwhile, Electronic Stability Control (ESC) enables safe driving across a wide range of surfaces and weather conditions. In addition to this host of standard driver assistance technologies, Lane Assist and Blind Spot Detection are available to owners in the optional Travel Pack. Lane Assist helps drivers remain safely within their lane, initiating a subtle corrective maneuver if they travel too close to the lane markings without indicating. Blind Spot Detection monitors the area immediately behind the KAROQ and alerts drivers to vehicles in their blind spot with an LED signal in the wing mirrors. KAROQ owners can elect to further equip their vehicle with front parking sensors in the Premium Pack, and Automatic Parking Assist in the Tech Pack, which uses 12 sensors around the car to perform parallel parking and forward and reverse perpendicular parking. The special Launch Pack also combines and contains all of the driver convenience and safety enhancements listed above. The KAROQ comes standard with an 8-inch screen high-resolution Bolero infotainment system, which has SmartLink smartphone connectivity, with Apple CarPlay® and Android Auto™, Bluetooth® with voice control, audio and streaming, USB, AUX and an SD card slot. Owners can browse their smartphone music libraries on the car stereo, display navigation apps on screen, make voice calls and more. Gesture Control is available as part of the KAROQ's optional Tech Pack, which contains a 9.2-inch glass design touchscreen Columbus system with satellite navigation. Owners can move through the system's main menu and submenus by simply swiping a hand over the screen. This has the added safety benefit of reducing the compulsion to take eyes off the road whilst driving. The Tech Pack also comes with digital radio (DAB+) and a premium Canton Sound System for superb in-car acoustics, boasting 10 speakers (four at the front, four in the rear, one in the dashboard and a subwoofer in the boot) and a power output of 550 watts. The KAROQ launches in Australia with the latest-generation 1.5-litre four cylinder turbo-petrol engine, making 110kW and 250Nm. A distinctive feature of the 110TSI engine is Active Cylinder Technology (ACT), which can save drivers up to 0.5L of fuel per 100km by briefly switching off the second and third cylinders when their power output is not needed. ACT is used between 1,250-4,000 rpm, between 25-100 Nm of torque and at speeds of up to 130 km/h. To further lower fuel consumption and provide optimal efficiency, the engine also features a Stop-Start system and brake energy recovery. The KAROQ's engine is protected by the vehicle's rough road package, which comes as standard. The rough road package consists of underbody protection underneath the engine, a cable protector, a brake line protector and additional plastic covers. In combination, these items insulate the vehicle from damage when driving on rugged terrains and prevent dirt and muck from getting into the engine bay. The KAROQ is initially offered with the choice of either a six-speed dry-clutch manual gearbox or a sevenspeed dual dry-clutch direct-shift (DSG) gearbox, both in front-wheel drive. Both transmissions produce sporty acceleration in lower gears and reduce consumption in the highest gear. The Volkswagen Group's DSG technology produces smooth and seamless gear changes, which occur within a few hundredths of a second and without any noticeable loss of traction. The KAROQ with DSG be driven in the automatic Drive and Sport modes, or the driver can take control manually using the gear lever. Eco mode in the optional Driving Mode Selection (available in the Tech Pack and Launch Pack) allows the KAROQ to coast with reduced fuel consumption when the driver lifts their foot from the accelerator. The all-wheel drive KAROQ, anticipated for 2019, will get an electronically-controlled seven-speed wet-clutch DSG, capable of higher levels of torque. The KAROQ's chassis is expertly engineered to support its performance as an all-rounder SUV, primed for adventure. The front axle has been placed far forward (a MacPherson design with lower triangular wishbones and a steel subframe) to provide a well-balanced load distribution on the axles. The rear of the front-wheel drive KAROQ uses a compound link crank axle. 17-inch alloy wheels are standard, with 18 and 19-inch wheels available as options. The vehicle's Electronic Differential Lock (EDL) monitors the four wheels and applies brake pressure accordingly to ensure stability and smooth handling in a variety of driving conditions and environments. Simultaneously, electromechanical powersteering grants the driver fine control at the wheel and firm contact with the road. The optional Driving Mode Selection in the Tech Pack (and Launch Pack) allows the driver to adjust the behavior of the steering, engine, DSG transmission, air conditioning and other controls to four different modes: Normal, Eco, Sport and Individual. The first three have fixed settings, while the Individual mode allows drivers to adjust the controls to their preference. ŠKODA vehicles are known for their 'simply clever' features. It is the brand's commitment to finessing the details, and making the owner's experience that little bit more carefree, that sets it apart from the crowd. The KAROQ sees the continuation of this tradition. With standard Advanced Keyless Entry including Smart Start (KESSY), KAROQ owners can lock and unlock their cars and start and stop their engines without laying even a finger on their keys. A key simply needs to be within 1.5m of the vehicle for KESSY to function, proving useful in situations where the driver's hands are occupied. The KAROQ has nine storage compartments situated near the driver and front passenger, including a parking ticket holder on the A-pillar, an opening near the rear view mirror designed to safely store sunglasses, and one under the front passenger seat containing an umbrella for rainy days. Other standard equipment includes LED-illuminated make-up mirrors in the sun-blinds, tablet holders for rear passengers, a LED torchlight and plastic Velcro mounts to secure items in the boot. Wireless charging is available as an option in the Tech Pack, allowing smartphones to be charged in the centre console without a cable – one less hassle for owners. The Premium Pack offers refinements such as perforated leather appointed seat upholstery, front parking sensors, electric opening and closing of the tailgate, 18-inch alloy wheels and stainless steel pedals. It also adds full LED headlights with the Adaptive Frontlight System, which adapts the geometry of beam from the headlights to different driving conditions, to enhance on-road safety. The Teck Pack most notably upgrades the KAROQ's infotainment unit to a 9.2-inch glass touchscreen Columbus system, with satellite navigation and gesture control. In-car acoustics are boosted with a 10-speaker Canton sound system. The Tech Pack also brings a range of other innovative technologies to the vehicle, including Automatic Parking Assist, wireless charging, Virtual Pedal (hands-free opening and closing of the electric tailgate), Driving Mode Selection, and digital audio broadcasting (DAB+). The Travel Pack equips the KAROQ with Lane Assist and Blind Spot Detection, which help drivers avoid collisions on the road. It also includes comfort enhancements, like heated front seats, an electrically adjustable driver seat with memory function, and automatically foldable door mirrors with auto dimming, memory function and LED environment lights. As Australian ŠKODA buyers overwhelmingly choose to specify their vehicles above standard with value-added packages, ŠKODA Australia is offering the first Australian-delivered KAROQs with a special Launch Pack. The Launch Pack combines some of the best features from the Premium Pack, Tech Pack and Travel Pack, including the 9.2-inch Columbus infotainment system, Lane Assist, Automatic Parking Assist, Blind Sport Detection, Driving Mode Selection, and more. To top it all off, it comes with a 3 year/45,000 km service pack. 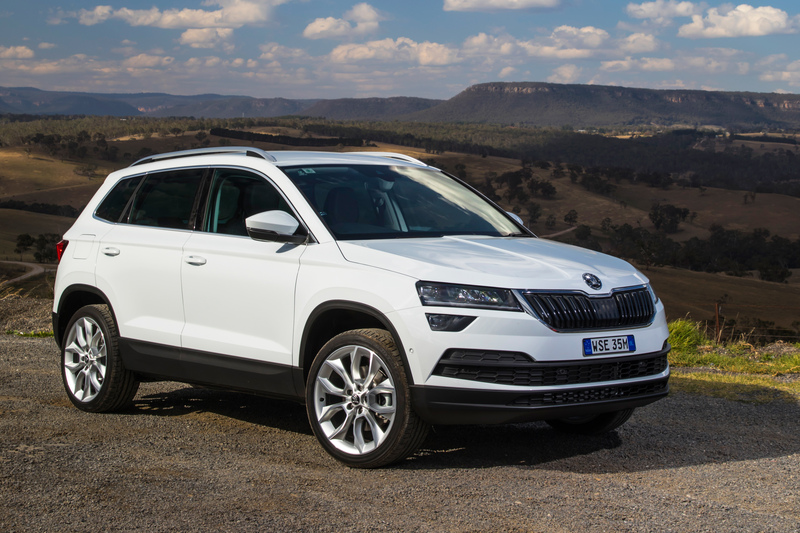 As with all new ŠKODAs sold in Australia, the KAROQ comes with the added peace-of-mind of a five-year, unlimited kilometre, factory-backed warranty which includes roadside assistance. A Guaranteed Future Value program is also available via ŠKODA Choice as well as surprisingly affordable ŠKODA-approved service pricing and prepaid service packs. is one of the longest-established vehicle production companies in the world. Since 1895, the Czech headquarters in Mlada Boleslav has seen the production firstly of bicycles and then, shortly afterwards motorbikes and cars. currently has seven passenger car models: Citigo, Fabia, Rapid, Octavia, KAROQ, Superb and KODIAQ. delivered 1.2 million vehicles to customers worldwide in 2017.
employs over 31,000 people globally and is active in more than 100 markets.